The chief economist of the world’s third largest bank, HSBC’s Stephen King, has compared the global economy to the Titanic. “The world economy is like an ocean liner without lifeboats.” As we have been warning in recent months, when another recession arrives, governments do not have the ability or the reserves to prop up the economy like they did in 2008. Global debt has soared by 40 percent since the Great Recession. We now have a staggering $200 trillion of debt globally, or almost three times the size of the global economy. It would be a “truly titanic struggle” for policymakers to right the economy, King said. He believes that we are now nearer to the next global recession than we are to the last one which ended six years ago. In that time, however, the world has amassed mountains of new unpayable debt – expanding 25% in the last six years – and the U.S. economy has been sluggish despite an unprecedented wave of money printing which was intended to boost the economy. Indeed, post recession growth has never been so anaemic in recent history. – The equity bubble may burst as increasing wages impair corporate profits. This would lead consumers to lose confidence triggering another an economic contraction. – Pension funds and insurers may not have cash to meet future obligations causing them liquidate assets. This may cause a scramble for liquid assets and mass panic-selling in an environment of low demand causing a collapse in asset prices. - If the Fed were to raise rates too soon it could expose the very fragile nature of the “recovery”. Neither governments, nor corporations nor households would have the strength to absorb the costs of servicing their debts should the Fed begin raising rates. “The world economy is like an ocean liner without lifeboats. If another recession hits, it could be a truly titanic struggle for policymakers.” Reports do not indicate if King speculates on what the next crisis would look like in the absence of adequate policy tools. We do not know how it will unfold either. But we suspect that after more that twenty years of Fed intervention to protect too-big-to-fails and a gargantuan build up of debt a monumental day of reckoning may then be at hand. In such an environment we would once again understand the true value of gold as a currency which is finite and which has no counter-party risk. HSBC’s chief economist does not mention gold as a potential life boat to protect from a titanic economic collapse. However, HSBC’s precious metals team are currently very constructive on the long term outlook for gold prices. In reaction to their chief economist’s warning, their precious metals analysts said, that any of the scenarios outlined by Stephen King would be positive for gold bullion. Given the significant and growing economic risks of today, it is prudent to have an allocation to physical bullion stored in reliable vaults in the safest jurisdictions around the world. Have you got your lifeboat ready? Today’s AM LBMA Gold Price was USD 1,211.00, EUR 1,083.45 and GBP 772.96 per ounce. Yesterday’s AM LBMA Gold Price was USD 1,209.60, EUR 1,084.36 and GBP 772.60 per ounce. 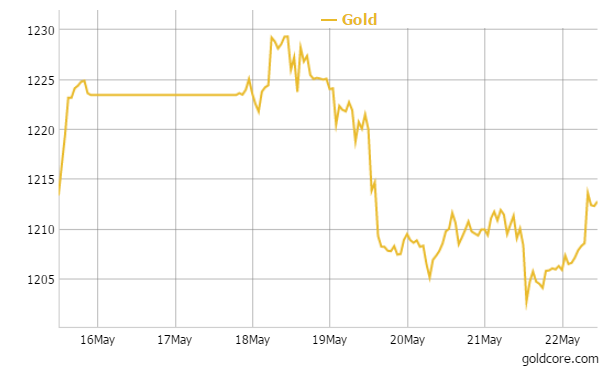 Gold fell $3.78 to close at $1,205.82 an ounce on yesterday, and silver remained unchanged at $17.12 an ounce. Overnight, gold in Singapore inched up 0.2 percent to $1,208.19 an ounce near the end of day trading. 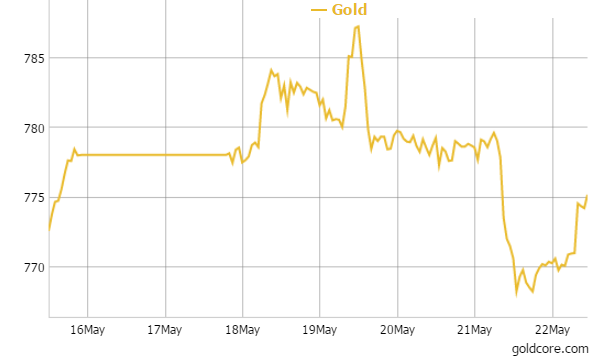 Gold is on track to trade down 1.4 percent it largest weekly drop in a month. Gold prices have rebounded today after ending yesterday down 0.3%, but appear to have run into some resistance at their 200-day moving average (1215). On the week, gold is down 0.7% and silver is marginally lower in dollars for the week but has eked out gains in euro terms. The biggest fall of the week was palladium, down just over 2%. On a daily basis, palladium’s the only precious metal lower today, down just over half a percent, while platinum’s up 0.3% and silver’s 0.5% higher. Gold was weak in dollar terms but strong in euro terms this week. The U.S. dollar gained nearly 2 percent this week as the euro weakened again. ‘Grexit’ remains a real risk. German chancellor Angela Merkel, Greek Prime Minister Alexis Tsipras and French president Francois Hollande are negotiating a cash-for reforms deal that would allow Greece to meet its debt repayments next month and join the ECB’s quantitative easing programme. “We can’t just throw Greece of the euro” – Juncker has threatened ahead of the crunch summit. Greece says a reform deal can come in 10 days, but Merkel is cautious – she warned that there is a ‘whole lot left’ to do on Greece bailout talks. Jitters remains about the next repayment which is due on June 5th. ‘Extend and pretend’ seems likely again but obviously this can only go on for so long before we get a very serious crisis and potentially contagion. Thomson Reuters’ Lipper service data showed yesterday that investors in U.S.-based funds removed $597 million out of commodities and precious metals funds in the week ended May 20, the biggest outflow since December 2013, showing negative sentiment towards the sector. However, the smart money continues to maintain allocations or accumulate positions. U.S. mining financier Oskar Lewnowski is preparing to launch a base and precious metals fund, sources have told Reuters. This is his latest step in recreating Red Kite – the famed trading and investment enterprise he co-founded a decade ago. Two years after going out on his own and creating a private equity investment firm Orion Resource Partners, the 50 year old New Yorker has already invested almost $1 billion in equity, loans and royalty streams into at least 17 junior mining firms, and hired a physical metals trader to handle supply. Russian gold reserves increased by another sizeable 300,000 troy ounces in April to bring total, declared Russian gold reserves over the 40 million mark – to 40.1 million troy ounces. There is of course the possibility that Russia is not declaring all of their gold bullion purchases and reserves, in the manner of the People’s Bank of China. 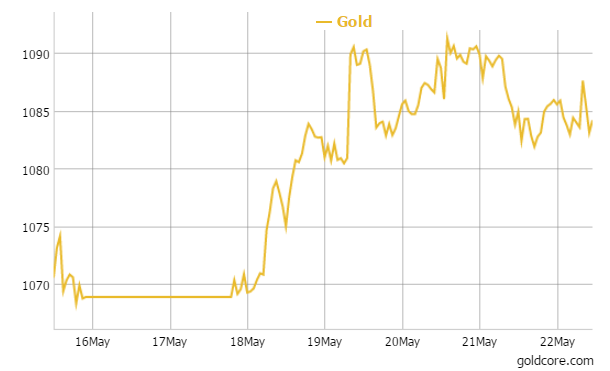 In late morning European trading gold is up 0.56 percent at $1,212.67 an ounce. Silver is up 0.68 percent at $17.28 an ounce and platinum is up 0.27 percent at $1,157.00 an ounce.